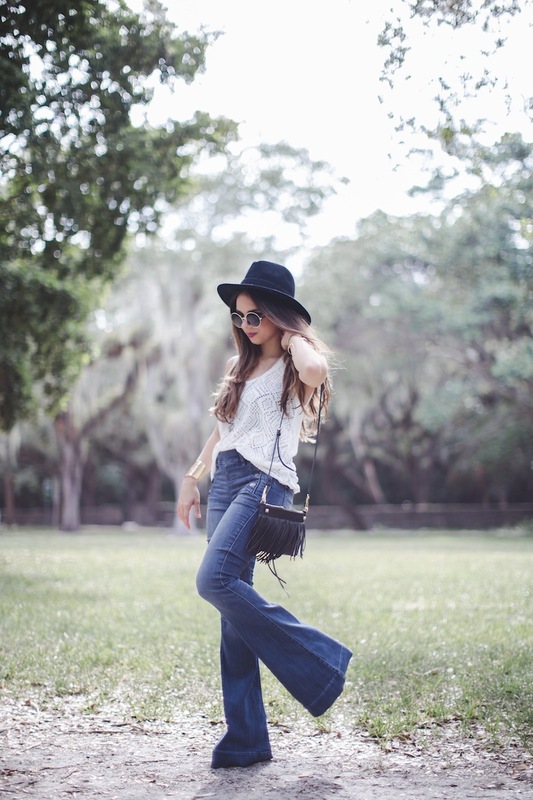 The 70s vibe ruled the runways in all Spring/Summer 2015 runway shows…bringing back flare jeans!! Honestly, I was a little tired on seeing skinny jeans anywhere and everywhere. Don’t get me wrong, I love my skinnies but also love being able to play with different styles! I was very excited to find this pair at Express. The wash is extremely versatile, I love the buttons (and don’t worry it has a side zipper so no need to unbutton and button them up every time! ), and they look so chic and on trend! Did I mention this style of jeans is also very flattering? It balances out your figure, and if there are high-rise + you wear them with high heels: HELLO long legs! If you are petite, like me, you know how exciting that is! (but make sure to take them to the tailor if they are too long….I remember how I used to drag my wide jeans on the floor in the early 00s- not cool Daniela, not cool!). This time I went for a simple look by just adding a white tee from Express’ new collection One Eleven…which you are going to see A LOT- the fabric is so soft and it’s perfect for layering! Final touches: a hat, a fringe mini bag, and gold accessories…perfect laid back look for the weekend! So dish your skinny jeans…and let’s bring back the flared jeans! Disclosure: This post was brought to you by Express. All opinions are my own. Totally need to check out Express. Love these jeans. Wow, so amazing and perfect with the top! Love your jeans and top! These jeans fit you like a glove! I love the buttons on top. Love this 70s look so much! Really pretty! Nice look! I need to revisit my flared jeans.. so fun!